Ascorbic acid, or vitamin C, is an essential nutrient required for collagen synthesis, bone and teeth calcification, healing of wounds, hemoglobin formation, growth and other metabolic functions. Vitamin C is found in all fresh fruits, vegetables and their juices. Citrus fruits such as sweet limes, guava, oranges, grapefruit, lemon, papaya and pineapple contain large amounts of this vitamin along with kiwis, berries, and mangoes. Vegetables like tomatoes, cabbage, potatoes, green and yellow peppers, leafy vegetables, Brussels sprouts, collard greens and broccoli are excellent sources. Apart from these known sources, there are some unconventional high sources of vitamin C in nature such as rose hips, Indian gooseberry, acerola berry and acai berry. Indian gooseberry, or amla, is a rich source of natural vitamin C, with a concentration of 600 mg to 1800 mg of ascorbic acid in every 100 g. Fresh amla juice contains 20 times as much vitamin C as is present in orange juice. Heating or drying of fresh fruits or vegetables can cause the loss of most of the vitamin C present originally. However, amla is an exception as it contains substances that partially protect the vitamin from being destroyed during heating or drying. Amla juice, which is highly acidic, prevents loss of vitamin C.According to an article on the JuicingForum website, naturally occurring vitamin C in amla is better absorbed by the body than the synthetic form of the vitamin due to the presence of bioflavinoids, which aid absorption. Amla is available dried, as marmalade, juice, powder, and in capsules. Rose hips are the fruit of a wild Dog Rose plant, resembling small oval or spherical cherries. Fresh rose hips are the cheapest and best source of vitamin C, containing 2,000 mg of vitamin C in every 100 g of fruit, which is more than 60 times the vitamin present in citrus fruits. 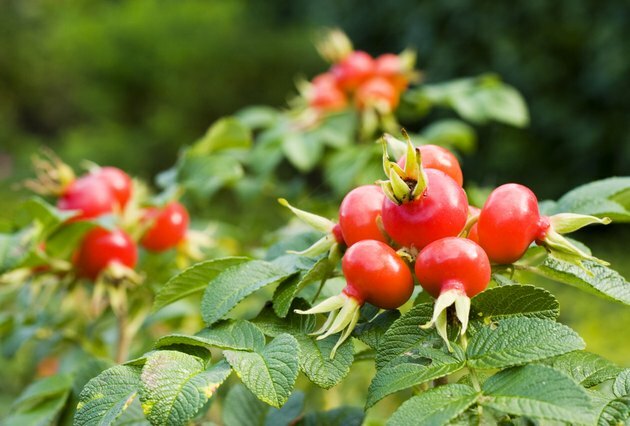 Rose hip is available in powder form or capsules and as rose hip syrup. Another excellent source of vitamin C is the acai berry. This bitter-tasting fruit typically consists of 15 percent to 22 percent of the RDA of vitamin C. A glass of acai juice consists of 45 percent RDA of vitamin C. As a nutritional supplement, it is available as a juice, powder or in capsules. Acerola, also known as the Barbados cherry or the West-Indian cherry, has been known historically as a concentrated source of vitamin C, containing 1,677 mg per 100 g of fruit. The Acerola fruit and its juice are used commercially in dietary supplements or for fortifying other juices and food products. A 180-ml glass of fresh acerola juice with a potency of 35 mg per ml of vitamin C can contain as much vitamin C as 14 liters of orange juice. The recommended dietary allowance for vitamin C is 90 mg per day for men and 75 mg per day for women. Pregnant and lactating mothers need 85 mg and 120 mg per day, respectively. Cigarette smokers need an additional 35 mg of vitamin C per day.